London’s architecture seamlessly blends the old and new world together, and there could not be a more appropriate place to admire this fluid magnificence than at the RIBA (Royal Institute of British Architects) Café & Restaurant. Only five minutes from Oxford Circus, RIBA offers a private yet exciting dining experience with the fresh and natural Modern European menu by Michelin-starred chef David Cavalier. Relax on the spacious sunlit roof terrace of this 1930s, Grade II-listed building or recline indoors and admire the funky award-winning architect-designed café-bar and stunning interior of this constructor’s playhouse. What are the best dining options near RIBA Cafe London? RIBA Cafe gyms, sporting activities, health & beauty and fitness. The best pubs near London RIBA Cafe. RIBA Cafe clubs, bars, cabaret nights, casinos and interesting nightlife. 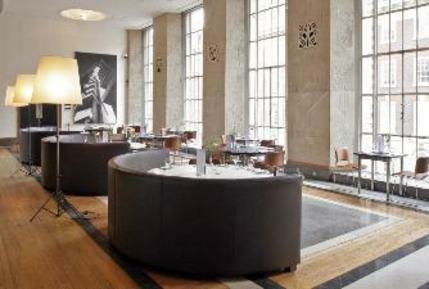 Where to have your meeting, conference, exhibition, private dining or training course near RIBA Cafe.